Pimiento cheese has recently broken loose of its Southern boundaries and now happily graces menus all over this cheese-loving nation. 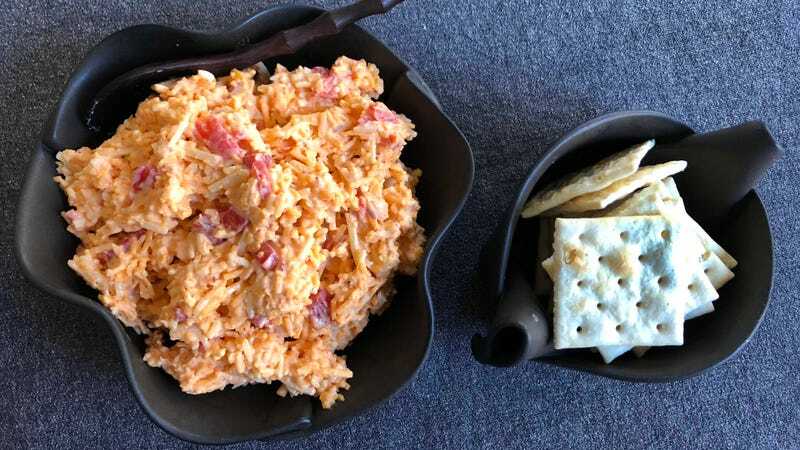 Which is enormously exciting, because pimiento cheese is a terrifically versatile item to have in your arsenal at any hour. It is happy to join you for breakfast, slathered on toast or biscuits, or as a decadent melty ooze inside omelets. At lunchtime, it makes for a deeply satisfying open-faced cold sandwich, or a peppery upgrade to a grilled cheese. At cocktail hour, it holds its own next to any creamy chèvre or pungent blue, is equally good pals with sweet crackers and savory, and it loves crudités of all shapes and sizes. Come dinnertime, top a burger with it, or scoop it into a baked potato or dollop it over any steamed vegetable. Korean food also seems to finally be getting its due stateside, both in straightforward restaurants and cookbooks and in all sorts of interesting fusion dishes. Korean barbecue is becoming as widely available as any other style of barbecue, as is Korean-style fried chicken. Korean flavors seem particularly suited to mashups, whether it is in a Korean barbecue taco or bulgogi burgers on rice buns. So when I was gearing up to make a batch of pimiento cheese for a gathering and spotted the jar of kimchi in my fridge, a lightbulb went on. Kimchi is a perfect addition to pimiento cheese, because it is peppery and vinegary all at once, providing wonderful contrast to the creaminess of the blend, and helping cut through the richness. It has a bit more textural contrast than pimiento, which is very pleasant in the mixture, and since it often packs a wallop of heat, it seasons the cheese spread beautifully. This recipe still contains some pimientos; the sweetness is a great balance for all the salty and savory flavors, and the pop of red is a welcome contrast to the orange spread. Put the diced pimientos into the rice wine vinegar in a sealed container and let sit at room temp for 2 to 4 hours or in the fridge overnight. Mix the two cheeses in a large bowl so that they are well combined (tossing lightly with your fingers is the easiest way to do this). If your kitchen is warm, try refrigerating the cheeses for 20 to 30 minutes after you grate them to make it easier to mix. In a medium bowl, mix the mayonnaise, onion, salt, black pepper, and pimientos with their vinegar. Stir in the kimchi. Add the mayonnaise mix to the cheeses, and combine well, so that it comes together in a cohesive blend. Taste for seasoning, since kimchi varies in spiciness, I find it rarely needs more heat, but if you like it spicier, add the hot sauce of your choosing a few drops at a time until it suits your fancy. Let sit at room temperature for 30 to 40 minutes before serving. Serve with any kind of cracker or crostini, or vegetables to dip. If you really want to amp up the party, brush saltine crackers with clarified butter and bake in a 400-degree oven until they are lightly browned. Add kimcheese.